The Itty Bitty Kitty Committee: Kitty On My Cup. Kitty In My Cup. Kitty On My Cup. Kitty In My Cup. Now that is a great mug, would love have one. That is the story of my life, keeping my food and drink for myself. 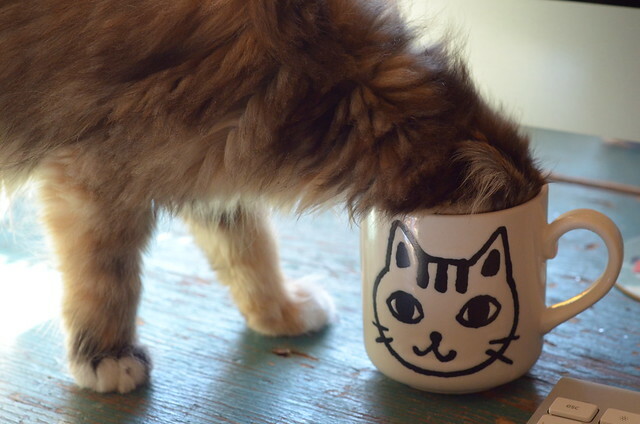 Well, the mug is labeled "cat"... why shouldn't Wylla assume that the contents are hers? Must have been hard to fit all that floof into the mug! The reason I now use tall, thin drinking glasses :) But it's worth a picture if she plunges her head into a glass- they really look funny! Mmm. Wonder what's in here? Even with her head floof temporarily de-floofed, I continue to wonder just how much is Wylla and how much is that fabulous coat! I Love Saturday posts. What a treat! Thank you for all these posts the past few days Laurie. They have been absolutely adorable. I love the comb out Bean gave Wylla - and Wylla has the cutest profile I have ever seen. She's a beauty. So's the Bean! Gorgeous girls. ps. And I second the thank you for all the extra posts. I am so in love with Wylla! Haha, this is a familiar sight.. Yes I have one of those!!!!!! who happens to like black tea. The best part of waking up...is kitten in your cup! Oh, my. It reminds you how tiny she is, since that looks like a normal-sized mug, and she can fit her entire head in.